The main or “Carrier” oscillator provides its three waveforms simultaneously. The two Modulation Oscillators each have a single output and a waveform selector. The Modulation Oscillators also have a voltage controlled Symmetry parameter which varies the duty cycle of the triangle wave output from sawtooth to triangle back to time reversed sawtooth, and also varies the sawtooth output to have an upward or downward kink in the middle, as well as controlling pulse width when the pulse waveform is selected. That magic is what we call Zing Modulation. Each of the Modulation Oscillators can modulate each of the Carrier outputs in an amount controlled by the Zing parameter. Zing Modulation is mathematically akin to ring modulation, but due to the synchronization of the oscillators (when an oscillator’s Sync button is on), the aharmonic sum and difference sidetones of ring modulation transform into complex but purely harmonic overtone spectra, which vary dynamically and dramatically with the frequency and waveshape modulations of the modulation oscillators. Each change in the Modulation Oscillator parameters – Frequency, Symmetry, Waveshape, Zing, and (in the case of Modulation Oscillator 2) Phase – will have a different effect on the timbre of each of the three Carrier waveshape outputs. What all this means is that whether you take advantage of Trident’s unique synchronous modulation capabilities (which you, of course, should), or just treat it as three superb, wide-range analog oscillators, TRIDENT offers a vast variety of dramatic sonic textures. – Three precision analog oscillators with dedicated 1V/Octave inputs and coarse control ranges of 20Hz to 20kHz and modulated ranges of 0.01Hz to 25 kHz. – Main Carrier oscillator with simultaneous triangle, sawtooth and pulse waveforms, with exponential and linear frequency modulation and pulse width modulation. – Modulation Oscillator 1 with selectable triangle, sawtooth and pulse waveforms with exponential frequency modulation, variable symmetry and symmetry modulation, and variable Zing level and Zing level modulation. – Modulation Oscillator 2 with selectable triangle, sawtooth and pulse waveforms with exponential frequency modulation, variable symmetry and symmetry modulation, variable Zing level and Zing level modulation, and variable phase and phase modulation. 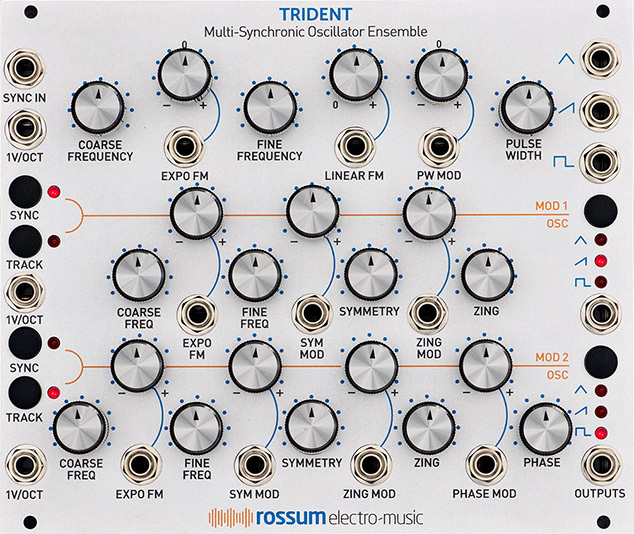 – Trident, like all Rossum Electro-Music modules, features solid construction, with thick aluminum panels, solid aluminum knobs, and quality components throughout. TRIDENT is 30HP wide and 25mm deep. Power requirements (max): 250mA +12V, 225mA -12V. Reverse polarity protected. TRIDENT will be available this spring from Rossum Electro-Music dealers worldwide. Wow. Can't wait to hear this. Also, massive props for that panel design. Despite the apparent complexity arising from the extensive labelling, it took me like 1 second to understand how it works. Always something unique and groundbreaking. Woah, very cool. The era of the wavetable is over! Everyone embrace new crazy wave shaping analog oscillators! I don't know what's more exciting, the thought of it as a complex osc or the idea of using it as a complex LFO. It's more like a complex complex oscillator though, right? Looks amazing. Anyone heard of a price yet? Anyone heard of a price yet? $599. Control Voltage has a preorder page up for it already. can´t wait to hear those modulation buses in action! Oh, some new thoughts on analogue complex oscillators, brilliant! also, 599 for three oscillators alone is one hell of a bargain. just a bit worried about those jacks between knobs, I do prefer them at the bottom. seriously curious about those fixed ratios and zing modulation! Wow, this looks awesome. Can't wait to hear it. Love what Rossum is doing in the analog realm! Damn. I like that these fools only go big with their modules. Hoping this sounds something like the original EMU modular VCO’s- one of my favorite VCO’s of all time. I'm right there with you. If I'm not careful I'm going to sell off my digital oscillators one by one. Thanks for posting that. Sounds amazing! Watching Dave Rossum present his modules always makes me smile. It really shows how much he loves what he is doing and his good natured demeanor and positive attitude is infectious. Watching Dave Rossum present his modules always makes me smile. It really shows how much he loves what he is doing and his good natured demeanor and positive attitude is infectious. Yeah, he seems like a really nice guy. Excellent demo, thanks for posting this.